There is no union contract written that covers every possible situation that can occur. There are some that try, but they are usually incomprehensible to mere mortals. Because of this there are usually two clauses in the contracts that are basically general in nature. One is the "Management Rights" clause, which states some of the general rights that management has. The other is the “Recognition" clause, which states the rights of the Union and the obligation of management to deal with the Union. The employer recognizes the Union as the sole and exclusive bargaining agent, for the purpose of establishing wages, hours and conditions of employment. Where Do Union Rights Come From? Processing Grievances is a Form of Bargaining! So under most of our contracts and under the law, the employer must bargain with the Union — and processing grievances is a form of bargaining — when unresolved issues regarding wages, hours and conditions of employment arise. This is a perfect example. 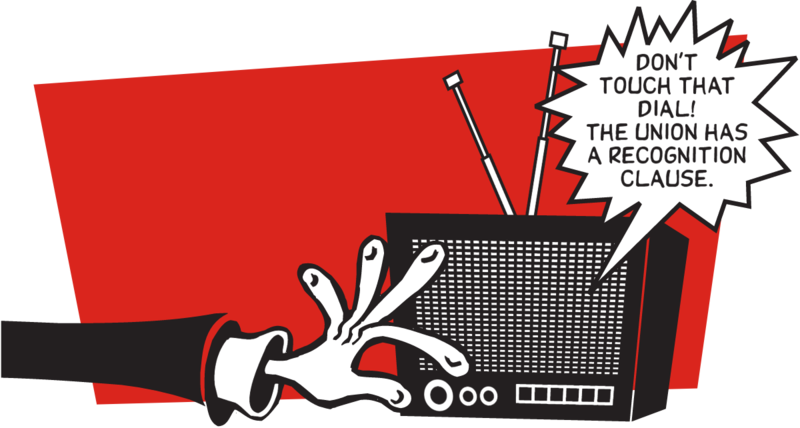 The right to listen to radios isn’t in the contract, but Sam will file a grievance under the recognition clause and can even note that the employer violated section 8(d) of the NLRA [or appropriate state law]. The employer is required to bargain with the Union over conditions of employment. Removing radios would be changing employees’ conditions of employment and therefore the employer must bargain with the Union before making any such change. Although the Management Rights clause says the employer has the right to run the work place, this is a general right and does not mean they can change any working conditions any time they want. Management Rights clauses that list specific items like, “management has the right to set starting times” means the union can’t complain about management setting starting times, unless some other part of the contract addresses the same issue. A Management Rights clause might say “management has the right to determine what methods are used in production” BUT they will have to negotiate with the Union over everything that changes the workers' working conditions. That could include rates of pay, amount of work, conditions of work (new equipment is noisy, dirty etc.) and if people will get laid off because of new machinery. So even if management has a specific right given to them in the Management Rights clause, they still may have to bargain over how using that right affects workers. There are some restrictions on making employers bargain over conditions of employment. Although there is no basis in the law itself or in the debate in Congress that set up the NLRA, the Supreme Court has put some restrictions on our rights. As may be expected, the restrictions favor the bosses. The Court decided there should be mandatory subjects of bargaining and voluntary subjects for bargaining. Never take the bosses word that they don’t have to bargain over an issue. Check with the Union first. Because even if the Union has “waived” its right to bargain or grieve an issue, the company may be obligated to bargain over the effect of the change. The voluntary list is fairly small but covers some important topics. For example it is voluntary for an employer to bargain over the decision to close plants or eliminate part of the business. They must, however, bargain over the “effects on employees” of such decisions. This is where we bargain over severance pay, etc. A decision to close a plant that is based solely on wanting to pay lower wages may move this issue into the “mandatory” bargaining category. Other “voluntary” items are picking supervisors, pre-employment tests, advertising, management salaries, etc. We must always try to make management bargain over any proposed change, no matter what the Management Rights clause says. We won’t win every one, but by sticking to our rights and having an active membership behind us, we can “train” management to bargain over most working conditions. Making management live up to its obligation to bargain with the Union is an important issue. Stewards should take the time to explain to members why respect for the Recognition clause is worth fighting for. Buttons, stickers, and other visible signs are useful in reminding management that the members won’t put up with seeing their rights trampled on. A union that is concerned that its contractual management-rights clause may be construed as a bargaining waiver should try to obtain new contract language, perhaps by adding a sentence affirming that the union is not waiving its rights to bargain. If this is not practicable, consider submitting a letter to management during contract negotiations stating that the union does not view the existing management-rights clause as a waiver of its NLRA bargaining rights. The employer must give notice to the union of the proposed change BEFORE any new policies are announced. If the union wants to negotiate, it must submit a request to bargain promptly. The employer is prohibited from implementing the change while bargaining is taking place. The employer must provide relevant information requested by the union and must conduct bargain in good faith, with the intention of reaching an agreement. Bargaining must continue until agreement is reached or the parties come to impasse (a deadlock after bargaining is exhausted). If the parties come to impasse, the employer can implement the proposed change without union consent. The employer cannot declare impasse if it has failed to supply the union with relevant requested information. The union hereby requests bargaining concerning the company's proposal to eliminate radios. Please advise the union as to when the company will be able to negotiate concerning the proposed change. As you know, labor law forbids any implementations of a new policy until the bargaining process is completed.